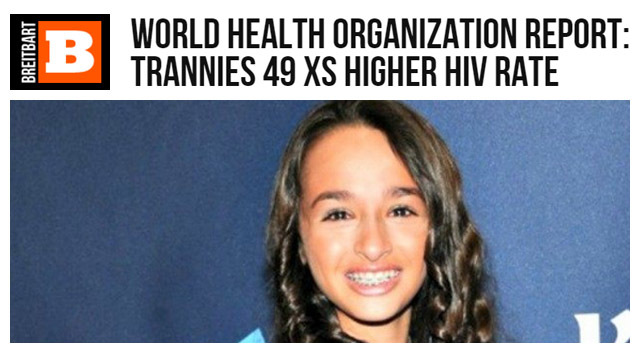 Breitbart News headlined a post about HIV rates in the transgender community with the anti-transgender slur "trannies," accompanied by an image of a 15 year-old transgender girl. Breitbart News contributor and anti-gay hate group leader Austin Ruse headlined a December 2 post with the anti-transgender slur "trannies." The slur was accompanied with an image of Jazz Jennings, a 15-year-old transgender activist who wrote the book I Am Jazz, and stars in the TLC series "I Am Jazz." Ruse's post referenced a recent meta-analysis by the World Health Organization detailing high rates of HIV among transgender women. Ruse used the study to attack Jazz Jennings as "a gender confused 15-year-old boy" and suggest that it's "dangerous" to "become 'transgender.'" A new study from the World Health Organization shows how dangerous it is to become "transgender." The WHO performed a meta-analysis of 15 different countries and found that men who dress as women are 49 times more likely to contact the HIV virus than the general population. Men who dress as women and also prostitute themselves are nine times more likely to contract HIV than those who do not prostitute themselves.